As many of you will know, well those who have had a cursory browse of my site, is that I like to know where my hunting dog is coming from. What it is made of. With a generic name for a whole country you are right in thinking that this dog breed is potentially quite old. Many people think that a few hundred years is old for a breed, and that is because many of our current day dogs only go back that far. BUT the Irish terrier potentially goes back several THOUSAND years ! There is no exact date on when they were developed but it is believed the area of their birth was round Country Cork, Ireland. There is more than a passing resemblance to the Airedale terrier in its looks, but it predates that dog by a long way. 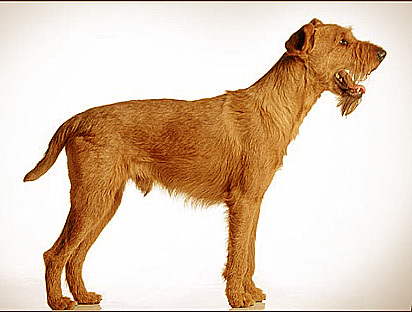 Like most modern day dogs, the Irish terrier is more often found as a companion dog. But the Irish love their dogs and many are still found on farms being used for close to their original purpose. Originally bred for hunting small vermin it is particularly good at hunting den animals such as otter and water rats,. With such fierce wild animals in close quarter underground, this dog is VERY fast and tenacious. They are brilliant hunting around water and swamps and are good swimmers. With their speed and agility they are also suitable to hunting birds – a rare thing for a single breed to be so multi skilled. They also have a fairly coarse coat making it easier for them to hunt and retrieve in thick bushland and forests without getting their skin punctured. Being a true hunting dog they can be quite headstrong and need good recall and discipline training before taking them anywhere to hunt. Their tireless pursuit of prey or controlled substances once trained make them also very good in police and military work. Hearing about how diverse and good a hunter these dogs are you might be surprised to hear they are gentle and caring with their human families. They are excellent with children and with their guarding instinct mainly need to be calmed down when ‘strangers’ come to the door. They can be difficult to housebreak and need to be watched carefully with other household pets.